I written this post to briefly explain the procedures for filing the paperwork for a new placer mining claim and the renewal of an existing placer mining claim. I include our experiences and what we learned. It is intended as reference material for me. I should note that I live in Arizona and this information pertains to Arizona and may be incorrect for other states. This information specifically applies to the 2009 and 2010 assessment years. Mining claim fees are due on or before September 1 each year. The initial cost per mining claim (load or placer) is $140 + $35 location fee. The annual cost is $140 per mining claim (load or placer). In the 2010 assessment year, my friend Josh and I went out looking for gold in known gold-bearing areas. 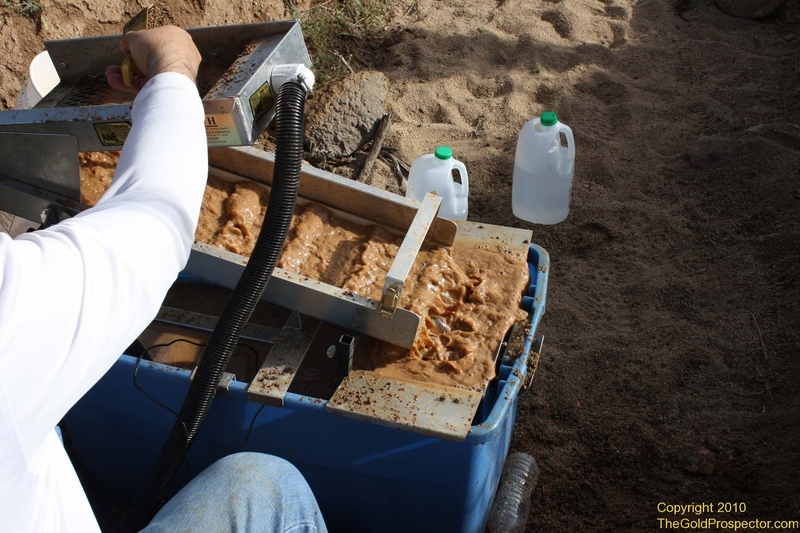 We sampled areas for placer (alluvial) gold using our recirculating mini-highbanker. When we found a place that was acceptable we first looked around for other claim markers to be sure someone else had not already claimed it. Its a good idea to look for private property signs and no trespassing signs too. I created a waypoint on our gps receiver and then we headed back home. Later while sitting in front of my computer, I downloaded the GPS waypoints into Google Earth and used the PLSS overlay to figure out where the claim is located. I should note that GPS is very unreliable for accuracy. When you are saving waypoints, you should take into consideration that the coordinates could be a few hundred feet off. This is why I like to use Google Earth. It shows a map of the area, the PLSS grid and the waypoints data all together as layered information so I can judge with better accuracy using the PLSS grid which Township/Range/Section I was at. I searched LR2000 and the County Recorder’s web site to see if that particular area is managed by the Bureau of Land Management and also checked if it is open to be claimed. Geocommunicator will no longer be available for mining claim research. It has been permanently discontinued by BLM. Use LR2000 instead. The land appeared to be available for claiming so a few days later we went out to stake our claim. By staking a claim we have legal rights to the minerals in the ground for 90 days starting from that day. We usually tap a 4 foot metal rebar into the ground and slide a white 5 foot capped pvc pipe over it. You can find the supplies from Home Depot. Make sure all the markers are at least 4 foot above the ground. Also put your information, date and corner coordinates at a center marker so if someone finds your claim they can identify the claim. You need 4 corner markers and and 2 center markers. * It can take several hours to walk around and tap all your markers into the ground so you should dedicate a cool day for that and always bring someone else along for safety reasons. Don’t forget to bring plenty of drinking water. * The Bureau of Land Management will accept two forms of payment – bank check or credit card. For the new placer mining claim, I had to fill out a Location Notice (MCF102), Mining Claim Map (MCF100a) and Maintenance Fee Form (MCF112). You can also download this KML file so you can visualize the mining claim in Google Earth. It took about two weeks to get a new claim approved. When that happens, the BLM will assign an AMC serial number to the mining claim and stamp all the original paperwork and mail it back to you. * The paperwork process can take longer sometimes. After we receive the paperwork, I immediately mailed all the originals to the County Recorder office. There is a fee to record your documents and I sent along a bank check. * The County Recorders office will accept two forms of payment – cash or bank check. It costs $14 per 5 page document set and $1 each page thereafter. You must include a cover letter describing what is to be recorded and a return mailing address. Note: the cover letter counts as a page. The County Recorder then makes a copy of your documents and gives you a record number for each set. It is then mailed back to you. The County recorder must receive the paperwork before December 30. Fail to do so will invalidate your mining claim. In the middle of the 2009 assessment year we purchased a placer mining claim from somebody. It was now our responsibility to renew the mining claim before September 1, 2009. We spent a few months prospecting for gold on that property and also helped to keep it clean from trash other folks left behind or trash that blew onto it. A small miner is someone who owns 10 or less mining claims (load or placer) nationwide. If you want to have more than 10 mining claims nationwide, then you are no longer considered a small miner. The Bureau of Land Management may allow small miners to pay less for their mining claims if the small miner has spent at least $100 worth of work and improvements to the mining claim itself. It is an incentive for you to keep the land looking beautiful for others to enjoy. The normal annual price is $140 per mining claim, but if you qualify and are approved, you can pay $10 per mining claim instead of the full amount. If you feel that you may qualify, you need to send in Forms MFC108 (notarized) and Forms 3830-2 along with your renewal paperwork. The renewal paperwork is just one form – MFC112. Mail form MFC112 along with a bank check to the BLM. – The Bureau of Land Management requires your paperwork to be mailed in by September 1 every year. – You can file for a load and placer claim on the same location, but the mining claim forms and costs are still separate. – If you fail to renew your mining claim (like we did recently), then you will receive a notice of abandonment from the BLM and you have to start the paperwork process all over again from scratch by submitting a new Location Notice, Mining Claim Map and Maintenance Fee Form + $189 – just as I explained above. – If you want to claim some federal public land, but not do any work on it, then you need to file for Notice of Intention to Hold Mining Claims/Sites (MCF110) instead of MFC112. – Only one person can claim 20 acres of land. Each quadrant of a section encompasses four 40 acre sections. So if you wanted to claim a 40 acre section of land, you need another person to be the co-claimant. Now both people can claim a whole 40 acre section. If both claimants decided to claim more than one 40 acre sections, you will need to give each claim a different name. The claim name does not need to be unique because every claim has a unique serial number that identifies it. Multiple claim names could be like “Lucky Strike 1, Lucky Strike 2”, etc..
– If you want to stake a claim in a national forest, then read the Forest Service Manual Chapter 2810 – MINING CLAIMS. If you intend on disturbing a significant amount of surface resources, you will need to send the District Ranger a Notice of Intention to Operate, then wait about 15 days for a response. The District Ranger will decide if approval of a Plan of Operations is needed. For more details, see the Code of Federal Regulations – Title 36 part 228.4 (November 2010 copy). I found myself a decent Cu/Ag/Au vein on open BLM land in Southern Arizona. I’m new to the whole claim process and I’m wondering wither I should wait to set my ground markers & file the paperwork till after December 30th (today being Aug 20)? I know I should wait till after September 1 to avoid immanent paperwork/fees , but not quite as sure about all the other paperwork coming due by Dec 30. My best guess is the Dec 30th maintenance/waiver fees wont apply (this year) as long as I file the paperwork after Sept 1 of 2012. Also I’m fairly certain this claim area is safe enough to wait before filing too. Since it is so close to September 1st, personally I would just wait to file for a new claim just after that since you say it appears to be safe enough to wait. After September 1, 2012 get your claim paperwork done and mailed to the BLM for approval and then once you get it back from the BLM send all paperwork to the County recorder before December 30, 2012 to get it recorded. Next year if you want to renew the claim, then do it before September 1, 2013 and send the renewal paperwork to the county recorder before December 30, 2013. If you have any questions regarding the paperwork process, you can always call your local BLM office and they will give you guidance. You can also search existing county records for other mining claims to get a better idea how other people fill out the forms. That information is usually available from the county recorder web site in which the claim is located. I have more trips to put on this site, so I will be updating it soon. Just been so busy with work this year. In March 2012, you will have paid a location fee and initial maintenance fee for the current 2012 assessment year. You will still need to make a renewal payment for the upcoming 2013 assessment year on or before September 1 2012. If we file a new claim now (say March) and have it ok’ed and recorded , do we submit the renewal paperwork September 2012 (6 months later) or is it good till the following September (2013)? I think everyone is getting a little nuts about GOLD prospecting I have been at it for over 20 years, and I haven’t made a millon cents so I dont think I’m going to see a million dollars. TV???? Where are the PDF claim forms???? Click on the “Gold Trail” link in the article. I added it recently. I’m planning to buy a patented mining claim with all sampling results, registered documents and all the detailed info about this mine. How can I calculate the price of this mine? I want to make sure that the price they offered is correct before I start the deal. How do you determne where the claim boundaries are using the section,township, range and county? I want to establish GPS locations for this to check the accuracy of where the claim markers are located. This is the first claim I have owned so I need some help. If this is a patented claim, your local BLM office and county recorder should have copies of the mineral survey maps and notes from the original survey. Recorder’s office should be able to provide tax parcel maps denoting the Township, Range and Section where the claim is located. You can scale the Latitude and Longitude from the USGS Quadrangle sheets to get you close. Remember that the system used on topo maps is not the same as you normally find on your GPS. The difference is in the 150 to 200 foot range. The survey monuments range from stone cairns to up-ended stones to 4×4 redwood posts for the older surveys and pvc pipe and t-bars rebar’s with surveyor’s caps for the more recent surveys. Good luck. I am buying a claim that is owned by someone else. What do I need to do to transfer the claim. I have a Quick Claim Deed (FormMFC 120), but it refers to attachment A and I don’t know what that is. Can you help me identify what I need to send with Form 120? The current claim owner has to transfer the claim to you. Call your local BLM and ask them for guidance. I regularly use these map overlays for hunting gold.